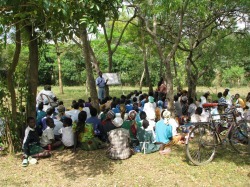 an impressive 256 children throught their work of running a farming programme. We have provided Niconet with a number of goats to distribute amongst the most vulnerable children and have taken 31 children to school through our scholarship programme. We have also provided the group with training on child rights, child care strategies and business and financial management skills.